Part of a series of works that began in 2013 A Distant Destination Part II turns the familiar upside down. Local landmarks have been mixed up, shook up, remodelled and altogether relocated in order to encourage a new appreciation of our everyday local environment.Pershore Abbey is dwarfed under the mock gothic arches of a casino and Pittville Pump rooms is seen crowned upon the constructed avenues of a countryside estate. How strange it is that these extraordinary places can easily become overlooked when passed everyday! 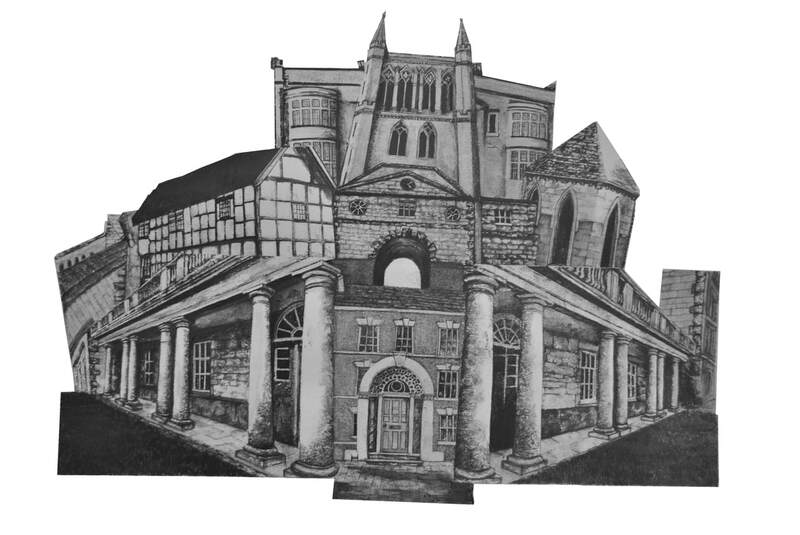 Through using collage, print and graphite these landmarks and more, have been reimagined. The familiar. The everyday is now a little bit different. The idea of a Utopia is a theme that runs throughout my work however within this exhibition Utopia is not something to strive for but to realise. Surrounded by historical features, yellow fields and a wealth of possibility is it the case that we just need reminding how lucky we already are?